Blooming. As the old song says, becoming is harder than it seems. There was a decided end in view for our April discussions. We wanted to make it clear that thriving never happens by accident. You have to be ready. But the goal beyond this preparation is to bloom. Blooming does not happen by accident either. For some, blooming is downright frightful, because you have to decide what kind of plant you are. Blooming happens when you are finally brave enough to declare to the world all that you believe in with all your heart. It all feels, well, so vulnerable. We know in our heads what we would like this bloom to look like. We know for sure that we do not want to be just another pretty face. But we need to have a reason to bloom in the first place. If we want to continue basking in the full glory of it all, we need a point and a purpose. There is a decided art to this becoming. There is also intentional design to successful small business. For the entrepreneur, blooming is a two-sided discipline–a fine balance between both art and design. For example, on the art side, Picasso never stopped to ask the people of Paris if they wanted him to use the color blue. He did not care at all what they liked. He had only an unquenchable desire to paint all that was in his soul; critics be damned. The resulting originality is so valued today that few people can afford to own such a work. Perhaps only on a postcard. I have met many entrepreneurs bitten by the bug of creative expression as well. But on the other side, to sell your goods, you have to care if someone likes it. And enough people have to like it to sustain. This is where the design comes in. Not everyone likes a Picasso. A thriving enterprise must be designed to serve the end user. And therein lies the difference between the two. Design has an intended end: to communicate a specific idea to a specific audience. Art, on the other hand, flows from inspiration. The viewer is the interpreter. Art creates tribes of people who either like it–or hate it–as the case may be. It is business suicide to design a product around anything other than what the customer wants. So, you may ask, do we conform our business to the desires of the masses and align with all their needs? Or do we stay true to the vision in our heads, and create great art, critics be damned? To bridge between the two–of doing business as an art, and doing business by design–is a coveted model. All successful businesses are a work of art. All are carefully designed. It takes time to find this sweet spot. It is a journey of connecting the dots. Many entrepreneurs never spend the time and effort to find where they can deliver the biggest bloom. To be frank, it is hard work. It takes bravery to work with what you have got, to use the seeds at your disposal, and grow in the environment that you have. And you have to make the most of it while the sun is shining. The successful entrepreneur makes a conscious choice of where they will fall on this continuum between art and design. There is no correct answer, only a difference in the way you market it. You can make a difference in the world either way, and neither answer is wrong. The point is to have a proactive intention. It is a waste of humanity when people are not doing what they were born to do. Whatever you want your bloom to be, start with something other than product. Start with the effect you want it to have. Start with what it means to the customer. Start with something other than money. (Money is the last reason you should do anything.) Start with an idea that is bigger than yourself. Only this kind of art and this kind of design will make a lasting difference in the lives of those you wish to serve. When you find this sweet spot, you will know it to be your best work. You will not have to ask if it is good. You will know by the response you get. Confidence blooms when you realize it is no longer about you. Only then, will you know the reason you bloom at all. Why do architects create so many copies of a blueprint prior to construction of a cherished project? Imagine all the contractors, trying to keep the big picture in their heads, and trying to remember all the details. It would be completely impossible for the structure to stay true to the vision as the architect intended without one. 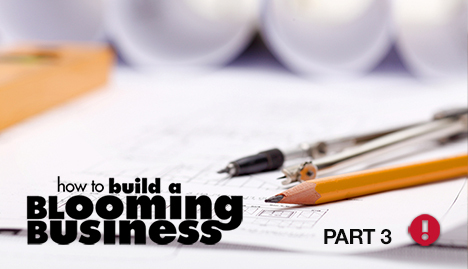 Your business also needs a blueprint. This blueprint is called strategy. A blueprint does not show every detail. But it does show the outline. Building your marketing plan without a preparing a strategy for success first is a complete waste of time. Especially if you intend for the finished product to look anything like you had originally planned. Strategy answers the question, “how are you going to win this game?” The definition of strategy confuses even the best entrepreneur. It is often mistaken for position, tactics, goals, or objectives. But if we do not understand the difference, we will face many serious problems. We will put the cart before the horse. Or we will be like a dog who will not let go of a big stick and thus cannot get in the door. We will waste time on things that will ultimately derail the goal. We will also implement tactics that undermine the big picture. Understanding and building a strategy will help us to create an advantage, even with limited resources. The word strategy came from the rhetoric of warfare. The Greek word Strategos means the art of the general. A good general will always understand the big picture. They will always know when and how to sacrifice a small part to achieve the greater goal. So how are you going to win? What is the best possible path to your business success? Strategy takes stock of all the resources that are available, including the skills and capabilities. It creates a plan to sustain an advantage and determines how to win continually over the long haul. Strategy is your long-term, big-picture plan for success. Tactics, goals, position, and objectives are the things you implement to get there. During the 11-12th centuries, the Mongols conquered the world. One of Ghengis Khan’s most famous generals was a man by the name of Subutai. He was one of greatest military strategists that ever lived. With a handful of soldiers, he was able to overcome huge armies and massive obstacles. His soldiers were skilled in archery, and performed well when battling in the field. They did not do so well, however, fighting in cities. It was Subutai’s job to create a battle strategy to achieve ultimate victory. He took all the strengths, weaknesses, and resources into account, and chose to avoid battle in the city altogether. He created a plan to divide his army into two groups. One group would attack the city and then quickly feign retreat. As they were escaping, the soldiers would draw the enemy troops out of the city for great distances. In this pursuit, they would tire. The first group of soldiers would lead them right to the spot where the second group lie in wait. This second group would wait to attack from the flank as they rode by, rather than meeting them head on. Using this combo of strategy and tactics, Subutai was able to conquer much larger forces. Subutai was able to conquer the armies of Hungary and Poland within two days, even though the battlefield spread across hundreds of miles. What is the point? His objective was to win the war. But it was the strategy brought him the victory. It is possible for the smallest of companies to win at small business–even over competitors with great resource–if you create and implement a winning strategy. A strategy creates boundaries. It is as much about what you do not do, as what you decide to do. If you know your strengths, you will know where you can best play the game. You will be able to turn the strengths of your competitors into their greatest weakness. Consider IKEA. IKEA figured out how to take a huge, heavy piece of furniture, make it into a kit, and ship it in a flat box anywhere in the world. No other furniture manufacturer was thinking about optimizing this part of the industry. IKEA advanced in an area where competitors were not prepared to compete. Marketing plans and marketing systems are good, but not if you get bogged down in the tactics and forget the big picture strategy. Social Media, email marketing, and website marketing–all are good. But not if you forget the big picture. We can create so much structure that we can forget to ensure we are using the best method to reach our ideal customers. We like being productive, and doing the things we know how to do. But it makes no sense to spend time and money doing the wrong thing perfectly. We can continue to spit out all the canned scripts, and do the things that everyone expects, all the right times. We get our systems up and running and then think all we need to do is just rinse and repeat–exactly as encouraged by the gurus in the last webinar. It is as if real people can be converted to loyal customers in six easy steps. Just stick the person through the door of our handy dandy customer replicator machine, and out comes loyal customers with stars on thars. Not. It does not take long before the customer realizes that they are being carried down an assembly line. They no longer want a star. It is not their agenda, but the company agenda. No one wants to be just another Sneech. When divorced from strategy, both the marketing plan and the tactics can backfire. It results in a failure to sustain, and failure to bloom. Spending the time to create a strategy is an investment in your own success. If you want to sustain in business, you must create a strategy to win. Combine this strategy with your marketing plan. 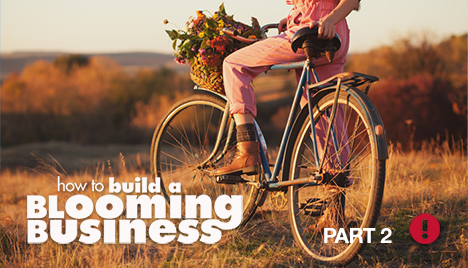 You will then bloom by design, and create a blooming business. Authenticity.This word is used so frequently that it is often overlooked. It is served up and tossed together with standard marketing fare so much that it looks like a side salad, rather than the meat of the main course. It is on the verge of falling into the bin of overused marketing words–right alongside strategize, incentivize, and monetize. Anything in that overused bin means that when we hear it, we zone out. It is suspect at best, and at worst, meaningless. When we are talking about authenticity in our day to day conversations, we are often referring to food, or culture, or valuable works of art. Sometimes, we are referring to the qualities of a good friend. But what does the word mean when we talk about authenticity in business? And what does the word mean in a world where much of marketing is suspect? While we all might end up with different definitions, we all know one thing: the bloom of authenticity is of inestimable value and exquisite beauty. Because of this intrinsic value, it is worth taking a closer look at the definition. Looking back through time, we can see that the meaning of authenticity and the rhetoric surrounding this word has changed. In the romantic and modernist time periods, authentic meant sticking to tradition. It meant a product handcrafted by an original artist, having the quality of agelessness. Authentic meant unchanging with an emphasis on the past. It meant using the same production processes that have been handed down from generation to generation–and the methods in themselves were the source and proof of the authenticity. The authentic product was perfect from day one, eliminating the need for iterations of improvement. The more the product stayed the same, the more authentic it would be. You can see how this definition is problematic today. Even if a business uses traditional methods, it is difficult for brands to sustain this kind of authenticity, let alone find new markets for their product. However, this list of the oldest companies in the US proves that Authentic brands in the traditional sense are still in existence. Fast forward to today’s Post-Modern mindset. Most Startups cannot make the same claims of yesterday’s authenticity. They have no 400-year-old heritage, so they are authentically what? Today’s authenticity is more about experience than objectivity. Customers care more about how a product makes them feel, than whether it is made according to tradition. They care more about how a product might help to solve their problems than whether the company can provide objective facts about it. They care more about what a product does than even what it is. Authenticity today is continually evolving products and inventing new answers to new problems to help the customer make sense of their world. If your business can consistently offer up an experience, your brand will remain the answer. Authenticity today, then, means that you do what you say you will do to provide a consistent brand experience, each and every day. You can see how this new definition is also problematic. The contemporary definition lacks proof and is susceptible to its exact opposite: inauthenticity. Inauthenticity is the chief reason consumers become disappointed in brands. The lack of authenticity will not keep a business from launching, but it will result in a failure to bloom. When brands fail to live up to their bloom, the customer drops their wilted bouquet and walks away. The competition is right there, all too eager to woo them with a bouquet of their own. Clearly we need a measure of both kinds of authenticity. How can your business bring the real deal to the world and become the brand your client cannot live without? Decide what kind of a bloom you want to be, and stay true to your Bloom. Say what you will do, and then do what you say. It is the fastest path to trust. Whether you lean toward the old or the new definition in your business, authenticity is the essential foundation of every successful marketing campaign. Though the definition has morphed through the years, Authenticity will always be what it has always been. And it has always been about truth. Truth is the most powerful marketing strategy you can employ. The best thing about this strategy is there is nothing complicated about it! Plus the ROI is fantastic. The more you use it, the more customers you will have. Wah-lah. Amazing, isn’t it? Do not allow your business to become just another fake flower. 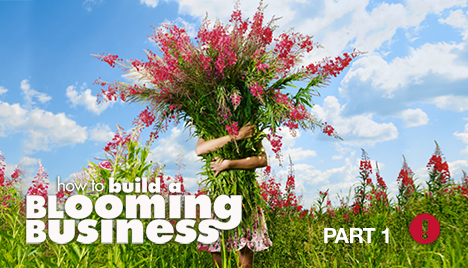 Use Authenticity daily and build a blooming business! If a face can launch a thousand ships, then without a doubt these four simple words have launched a million innovations. It is a special person that hears these words and accepts them as a challenge. I know many such persons. They are called Entrepreneurs. Game Changers. Innovators. They use these kinds of words as a launchpad. Instead of shriveling up in defeat, they roll up their sleeves and begin to alter the course of the world. Instead of viewing the naysayer as a big wet blanket, this person becomes their biggest inspiration. What is the difference between inspired and discouraged? What kind of environment produces the likes of Einstein, Henry Ford, Walt Disney, Orville and Wilbur Wright, Abraham Lincoln, and Alexander Graham Bell? They were often rejected, discounted, forgotten, overlooked, and even ridiculed. Many a genius has been told they would never make it. And I have to wonder if their genius would have ever fully developed without this resistance. The more they were knocked down, the more they stood tall. The more they were discounted, the more it confirmed the value of their work. The more they were hindered, the more they persisted. It is not sunshine and rainbows that causes someone to succeed. Sometimes success is found in the very obstacles themselves. These past few weeks we have been discussing how small business is a lot like farming. A farmer must prepare and do many things to ensure a crop will grow and flourish. There are many internal hindrances that we entrepreneurs place in our own way, and a seismic shift in thinking is needed to overcome them. But there are just as many external obstacles in our environment that we must plow through as well. We will stumble over these rocks if we do not recognize them for what they are. Endless wet blankets. Unfortunately, the words “you can’t do that” are often uttered by those near and dear to us. A lack of support from family and your significant other can undermine your confidence. The more you love them, the more their words affect you. Maybe you need more support. Maybe your family does not believe in you. Maybe you wish they would show more interest. Whenever someone has power to pull our strings, it is because we have given them permission. We need something from that person. What is it? Identify that something, so that you can diffuse its power. If someone is pulling the rug out from underneath your feet, you do not have to remove that person from your life. Sell the rug. Keep in mind even Jesus’s family that thought he was nuts! Endless shoulds. Shoulds are another kind of pressure put upon us by people who feel they know what we should be doing better than we do. When you have to make tough choices to achieve your goal, you will not always receive applause. Some might be jealous of your tenacity, others may be jealous of your time, and still others may not like you anymore. You cannot please everyone. “Why don’t you just forget about this crazy idea and get a nice steady job working for your Uncle Bob?” Keep in mind you do not want to get to the end of your life to find out you are now as boring as your Uncle Bob. Endless rejections and strike outs. The more you are out there doing what you are born to do, the more you will be rejected. Rejection is a constant. Your strike outs will increase because you are creating more opportunity to strike out. Keep in mind, you are also creating more opportunity to succeed. Babe Ruth had more strikeouts (1,330) than he had home runs (714). Endless monkey wrenches. No business is without problems. Every problem is a chance to improve systems, management, and leadership skills. You can plan on having employee problems, insurance issues, and conflicts from miscommunication. You will always have more red tape and more government regulations than you would like to have. It is all a part of the game, and the game is only won if you play by the rules. Having a bad day? Keep in mind, those no good, horrible, very bad days, can lead you to the biggest improvements in your business systems. Endless competition. If you are doing your best work, you need never fear the competition. Your biggest competitor in business will be your own apathy. It takes a lot of work to get a business up and running. Once your systems are on a roll, there is a strong temptation to sit back and run on autopilot. Keep in mind, coasting is akin to going backward. Rather than a liability, our external environment is often the source of our greatest growth. Rotten stuff, stirred up in the soil, will create the best plants and the most beautiful blooms. Hot water? Make tea. Trash? Create treasures. Let the daily struggle make you stronger. I dedicate this post to all the entrepreneurs who have made a commitment to overcome in the daily struggles of business. Do not allow your business to bring out the beast in you. Let it help you become your very best. Is this series helpful to you? Are you experiencing a seismic change in your environment? Tell me about it below. I would appreciate your thoughts. Who Says You Can’t Judge a Book By Its Cover? What causes one small business to flourish, and another to wilt? All this month we have been talking about how running a small business is a lot like farming. In Iowa, an abundance of harvest is a natural consequence of planting. It is just what seeds do here. But flourishing is far from simple. It only looks easy. Behind every bumper crop, there is a farmer that has planned, prepared, cultivated, and plowed. She has done everything within her power to negate any hazards that will hinder her efforts. 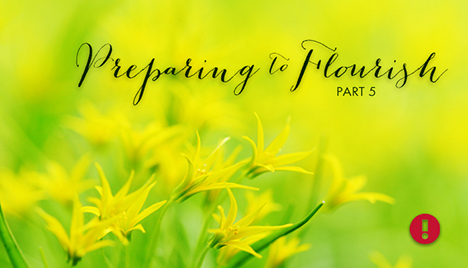 Only after careful preparation will the seed have a fighting chance to sprout, grow, and flourish. Successful entrepreneurs know what they are planting, who they are planting it for, and why. They know what kind of bloom to expect. 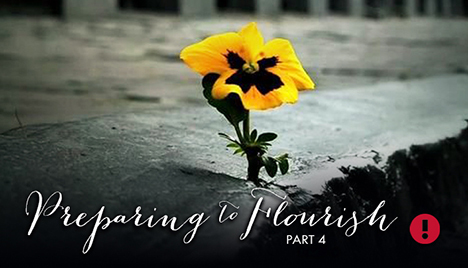 When it comes to blooming, they put themselves out. They do not react to the marketplace. They create it. They do not fear the competitor, because they know their service is unmatched by its very design. They tell their story with fanfare and style, knowing their customer will respond. So what causes a small business to wilt? Wilt spreads when a business lacks the ability to create a strong emotional connection with their customer. Entrepreneurs distracted by sales quotas. Rather than focusing on how they can best help the customer, they get mired in mud. In trying to sell to everyone–they reach no one. There are a million and one ways to communicate today. There are also a million and one ways for your message to become convoluted. Choosing a specific customer segment is scary, because it means ignoring the others. But instead of losing customers, focus will help you gain more of the right kind of customer–the kind you are most suited to serve. Focus will enable you to speak their language. Your message will achieve a new level of clarity, and will resonate further. You will reach more people with half the effort. Your business will begin to express personality. People cannot connect with washers and dryers, tires, and investments. They can only connect with personality. Personality creates context. This personality can make your customer feel that your products were designed just for them. One of the best ways to express personality is through good graphic design. Good graphic design can create context through intuition. When you are creating first impressions, it is context, not content, that is king. Graphic design can create just the invitation you need to attract the right customer like shavings to a magnet. Have you ever gone into a book store just for fun? Sure you have. You dig through the stacks, hoping for a new novel that will keep you awake long after bedtime. The design of a book jacket catches the corner of your eye. It pulls you in. It prepares you for an experience and provides anticipation of the story inside. At an intuitive glance, it helps you to decide whether the book is provocative or prosaic, quirky or captivating, comforting or gripping. You decide to buy the book, and primarily from the influence of the cover. It just looks inviting. So who says you can’t judge a book by its cover? You can. And you do. The same is true for your business. Your business has a jacket. Good graphic design invites your customer inside your door. It prepares your customer for an experience. What experience do you want your graphics to convey? What words would you use to describe it? Good graphic design can express each one of these qualities. Everywhere your company appears, from your logo and your marketing materials to the sign on the building, your designs should reflect your story, purpose, mission, and vision with all the appropriate colors, shapes, styles, and fonts. They should declare who you are–the authentic you. They should send messages, even without words, to the right customer. Getting it right means spending the time to discover what is authentically you. Getting it right means spending the time to discover what you want your business to be when it grows up. Getting it right means spending the time to discover how you can enrich your customer’s lives. Getting it right means spending the time to ferret out what it is that your customer really wants, and how to make them feel like they belong. Why is it so necessary to make an emotional connection with our clients? Because while our logical side considers the features and benefits of a product, we buy with our emotions. We buy shoes, not because they have a quality sole, but because they make our souls feel stylish. We buy the car, yes partly for the quality under the hood, but mostly because it makes us feel successful. You will never make connection spouting features and benefits. Great design helps you connect with the emotional side of your customer’s brain. Successful small businesses know that business is about people, about empathy, and compassion. Successful businesses invest in design. Good graphic design can prepare your business to flourish. It’s the mark of a growing concern. May you find your bliss in blooming.